The rotational benefits of pulse crops in a cereal and pulse rotation are well known. Including pulses in rotation is shown to increase soil available nitrogen (N), improve soil moisture reserves in deeper soil depths, enhance soil microbiology and soil health, and increase yield of a subsequent cereal crop. However, research had not measured to what extent residual soil N and soil moisture contribute to those higher yields. Wheat yield after lentil was 18 per cent higher compared to continuous wheat. The rotational benefits of pulse crops in a cereal and pulse rotation are well known. 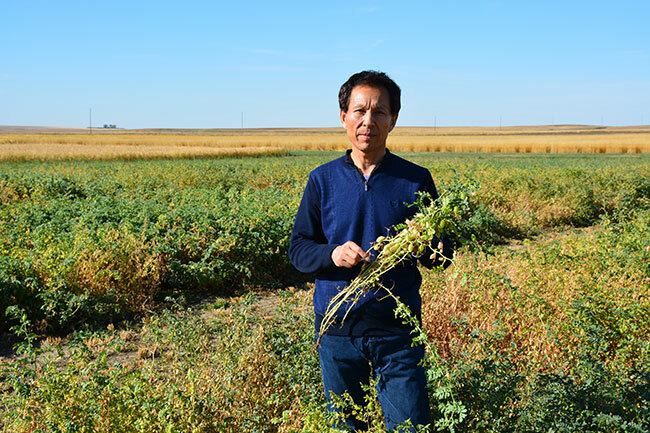 Research scientist, Yantai Gan with Agriculture and Agri-Food Canada (AAFC) at Swift Current, Sask., set out to answer that question. His research began in 2010 with a four-year crop rotation study with three rotation cycles. The first starting in 2010 and ending in 2013, and the second starting in 2011 and ending in 2014 – both at the Swift Current location. The third cycle was at Brooks, Alta., starting in 2011 and ending in 2014. “We thought that a higher frequency of pulses in rotation might increase residual soil water and nutrients, which provides greater benefits to the succeeding wheat crop compared with a wheat monoculture system,” Gan says. Nine crop rotations were compared including pea, lentil and chickpea in different rotation intensities with wheat. The rotations were selected to see how shallow or deep rooting pulse crops would impact soil moisture and nutrients for the subsequent wheat crop. The fourth-year crop was always wheat – this was when nutrient, moisture and yield were measured. 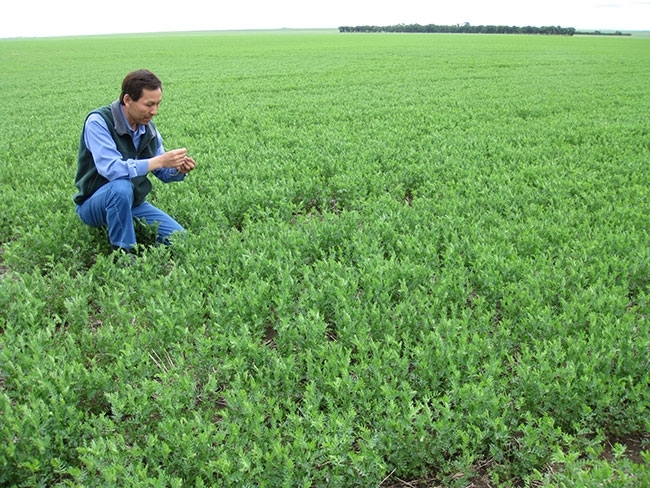 In the research, chickpea rotations produced unexpected results. As a deeper-rooted and longer season crop, typically less soil moisture is found in the soil profile after chickpea. That wasn’t the case in this study, but Gan explains chickpea did not yield very well in the trials because of the wet growing conditions and high disease pressure. “Normally, you would expect chickpea to use more water as a longer season crop, and would expect lower wheat yields the following year. Because chickpea didn’t grow very well, it left more moisture in the soil for the subsequent wheat crop to use,” Gan explains. Wheat yield after lentil was 18 per cent higher compared to continuous wheat. Similar to other research studies, wheat yield after pea or lentil was higher than after wheat. Wheat yield after pea was 26 per cent higher and 18 per cent higher after lentil compared to continuous wheat. Part of the reason for higher yield after pea or lentil was additional soil moisture. Pea and lentil are shallow-rooted crops with approximately 77 to 85 per cent of their roots located in the 0 to 16 inch (0 – 40) centimetre (cm) soil depth. This resulted in higher water content at soil depths of 24 to 36 inch (60 – 90 cm) depths. Rainwater use efficiency (RUE) was also higher when wheat followed pea or lentil compared to wheat following wheat. This was calculated by dividing wheat yield with growing season precipitation. Averaged across the sites, RUE for wheat in the fourth year was 22 per cent higher when wheat followed pea or lentil compared to following a wheat crop. Gan says that higher RUEs of wheat in the pea and lentil rotations could be because pulse crops leave “biospores” in the soil that allow better root and moisture movement in the soil. As expected, the pulse stubble was also higher in soil residual N measured at time of seeding wheat in the fourth year of the cycle. Compared to wheat stubble, soil N in the pulse fields was 52 per cent higher at Swift Current in 2013, 68 per cent higher at Swift Current in 2014, and 110 per cent higher at Brooks in 2014. While these measurements were higher than other research results, higher soil residual N on pulse stubble is a widely cited benefit of including pulses in rotation. In the research, Gan also calculated what benefit the additional soil residual N and soil moisture following pulses in rotation contributed to the higher wheat yield. His analysis found that residual soil water and soil N together was responsible for 27.5 per cent at Brooks in 2014, 24 per cent at Swift Current in 2014, and 10.6 per cent at Swift Current in 2013 of the wheat yield increase – an average of 30 per cent. The other 70 per cent of yield response in wheat is unknown. Regardless of where the rotation pulse benefits come from, pulse growers are benefiting from having pulses in rotation. “Conventional wisdom is that part of the rest of the yield response is related to the reduced disease pressure of wheat in the more diversified rotation systems. An important area of pulse rotational benefits is that the previous pulses promoted the activity of beneficial microbial community in the soil. Growing pulses in rotation improved many attributes of the soil, and we’ve been working over the past five years to understanding these benefits,” Gan says. How are you monitoring your stored grain?